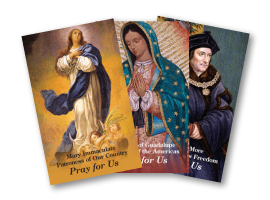 Three prayer cards for Fortnight for Freedom from USCCB. To download 3 cards click here and here and here. The Bishops of the U.S. are asking us to join them in prayer for our country in a campaign called the Fortnight of Freedom. “The fourteen days from June 21—the vigil of the Feasts of St. John Fisher and St. Thomas More—to July 4, Independence Day, are dedicated to this “fortnight for freedom”—a great hymn of prayer for our country. Our liturgical calendar celebrates a series of great martyrs who remained faithful in the face of persecution by political power—St. John Fisher and St. Thomas More, St. John the Baptist, SS. Peter and Paul, and the First Martyrs of the Church of Rome. Culminating on Independence Day, this special period of prayer, study, catechesis, and public action will emphasize both our Christian and American heritage of liberty. Dioceses and parishes around the country have scheduled special events that support a great national campaign of teaching and witness for religious liberty.” From the USSCB Website. We would like to encourage everyone to get involved. Pray, fast, call your representatives in Washington to let them know how you feel about this issue. It is interesting to note that this fortnight of freedom began on July 21 the vigil of the feast day for both St. Thomas More and St. John Fisher who were martyred for their faith. They were martyred because they would not accept the decrees of Henry the Eighth who in order to marry Anne Boleyn made himself head of the Church of England. Neither of these men would accede to his decrees and both went to their death rather than compromise their faith. Like them we are slowly but surely facing an uphill battle for our faith today. They are models for our us. It seems to us that many of the 10 commandments are at the forefront of our society’s most grave battles – moral battles about the dignity and value of human life and marriage. We can see that the 10 commandments were a divine gift intended to elevate human living and direct it towards God and virtue. So today, for believers to live according to the 10 commandments, in this time of moral crisis, is no small accomplishment. Let us encourage each other continually to meet this challenge of our time, seeking opportunities to lift up these and other noble moral principles which point towards the Culture of Life. And let us pray for our families and our children an join our Bishops in this Fortnight of Freedom.